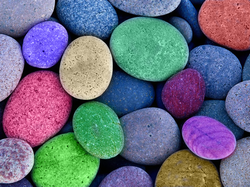 - Colour is one of the most attractive properties of a mineral. - The colour of a mineral is also a clue to it's identity. - Two or more minerals may have the same colour. - Depending on what's inside a mineral determines what colour it is. - Corundum (made of aluminum and oxygen) is white when pure. - When corundum contains titanium and/or iron, it is blue (and called a sapphire). - When corundum contains chromium, it is red (and called a ruby).